Discover how your peers are accelerating precision genome editing to the next level to realise the full potential of this unstoppable technology. 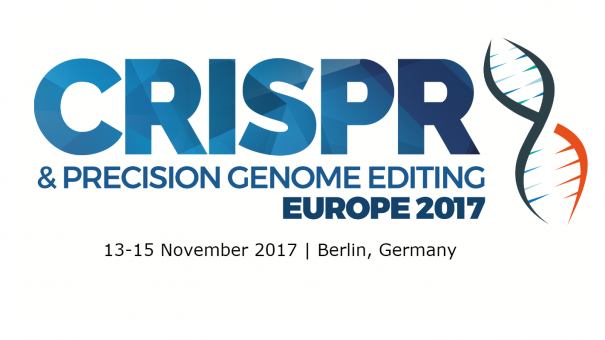 With CRISPR officially cemented as the editing tool transforming basic research and pharma R&D, the 2nd CRISPR Precision Genome Editing Europe 2017 (Berlin, 13-15 November) is the forum to stay abreast and capitalise on with vital developments in a industry showing no signs of slowing down. The CRISPR Europe Congress is back with key technology and industry developments that are uncovering more innovative applications of this breakthrough technology. From disease-specific modelling and drug discovery to delivering clinically safe and effective therapeutics, this CRISPR Congress will help you optimise and customise your CRISPR workflows to precisely achieve your genome editing goals. Experience the full value of this technology in base editing, primary cell editing, in vivo delivery, antiviral drugs & next generation gene therapies. Meet experts and leaders from large pharma, biotech, technology companies and academic institutions and discover how they are developing innovative solutions to advance delivery methodologies for biomedical research to advance future breakthrough therapeutic applications.